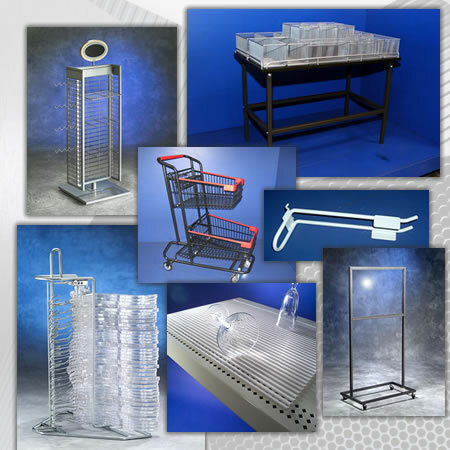 SPC Display Group manufactures many different types of standard metal, wire, MDF and plastic store fixtures and POP displays, along with sign holders , display hooks, including peg hooks, hanger storage systems, plastic shopping baskets and other accessories, and OEM component parts. But it’s our custom design and manufacturing policy – "If you don’t see it...ask for it" - that really distinguishes us. Perhaps you need a different style, height, width, length, or gauge for your store fixture, POP display or sign holder? More shelves? Perhaps a different finish? Justask for it. Our in-house design team, more than 50 years of experience, domestic manufacturing capabilities, and successful long term manufacturing partnerships in China allow SPC to bring you effective merchandising solutions at the best values possible. And, with SPC on your team, you can trust you’ll have consistency across the line, whether you have a short run or a high-volume rollout. Please visit our portfolio to see a few examples of our many completed projects.